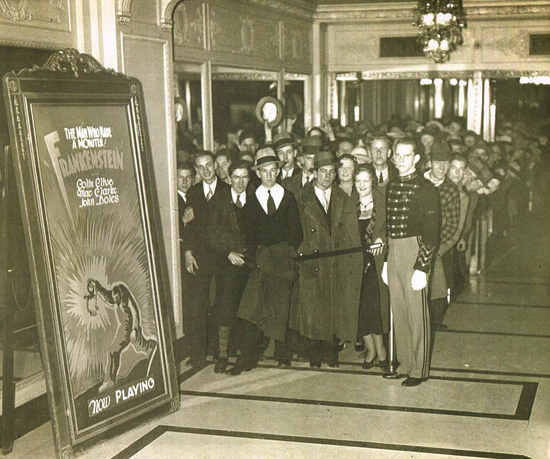 Spotted on the Zombos’ Closet blog, this remarkable photo showing patrons crowding the lobby and trailing out to the street, waiting to see Frankenstein (1931) on its first run. The anticipation is palpable. Soon as the usher drops the velvet rope, you know there’s going to be a scramble for the best seats in the house. 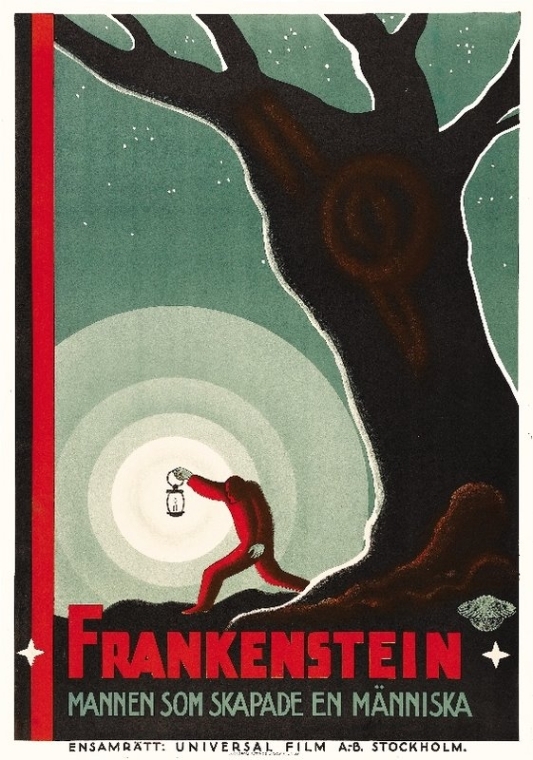 Oh, to have seen Frankenstein back then. Today, the film’s themes and design have been sampled to the point of becoming clichés, and The Monster is a universal icon. We can only imagine how perfectly thrilling it must have been when the film was new. There’s no provenance given here, this could be any theater in the English-speaking world. Note the fabulous and very rare “graverobber” poster. I don’t know of any of these that have survived. I’ve only seen this image before on a Swedish poster and as a line drawing used in newspaper ads. Zombos’ Closet, operated by John Cozzoli, is a superlative blog devoted to the celebration of horror in popular culture. It touches everything from Halloween and B-Movies to discussions on horror fiction and serious studies of the genre. It is also a wonderful resource for images. Case in point, check out this recent posting of the complete, original 1942 pressbook for The Ghost of Frankenstein. With thanks to John Cozzoli. Thank you, Pierre. Your kind words, coming from such a superlative (and award winning) blogger and authority on The Monster just made my day. You pointed out the most thrilling part here, the waiting to see something completely new, novel, and thrilling. What a fantastic experience to have had. I envy these people. It's possible, though not a certainty, that the graverobber display in the photo isn't a printed poster, but a unique one-of-a-kind creation (probably a tempura painting, possibly with elements added in collage) of an artist employed by the theater to produce such decorations for the lobby, front entrance, and marquee. Many of the big city movie palaces had such craftsmen on the staff; I have a 1930s Studio hardcover by "Duke" Wellington showing dozens of examples of his work for such theaters. Sadly, since artwork like that was seldom taken very seriously back then, it's likely that very little of it has survived, thrown away or stored carelessly or cannibalized for other displays.